Influenza A and B are the usual suspects for the flu each year. And according to the Center for Disease Control (CDC), between 54 to 70 percent of people age 65 and older who contract the virus are hospitalized annually. Statistics also show that seniors are more likely to suffer from flu complications than younger people. And with the record breaking cold temperatures we’ve been experiencing here in the U.S., now more than ever, it’s important to take the proper precautions to keep your senior safe and in optimal health. If you’re not sure exactly how to help your loved one safeguard against the virus, Freedom Home Care offers a few tips for prevention below. This may go without saying, but the number one way to ward off the flu virus is by being vaccinated. This is true for both young and old alike. For anyone 6 months and up, The CDC recommends getting a flu shot each year before flu season begins. Older loved ones are encouraged to be vaccinated annually to prevent unnecessary health risks. 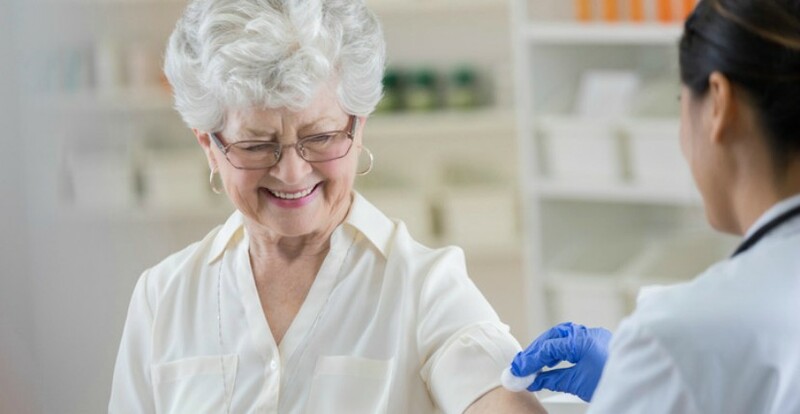 In fact, doctors administer a special high dose flu vaccine designed especially for seniors to help strengthen their body’s immune response against the virus. Experts say this flu shot is 24 percent more effective than the regular vaccine and much better at preventing the onset of the flu in the elderly. Because the influenza is spread through direct and indirect contact, coughing, sneezing and touching contaminated objects can leave you susceptible. Washing hands frequently with soap and water for 20 seconds helps combat unwanted germs. Pay special attention to the nails, wrists and forearms. If your older loved one has trouble with mobility, hand sanitizer is another excellent option. Contrary to popular opinion, sanitizer is one of the best ways to eliminate germs. Researchers say alcohol-based hand sanitizers kill most bacteria, viruses and fungi in less time than it takes to wash your hands. Bacteria and viruses can travel quickly in settings where a lot of people gather. This is true for seniors residing in nursing homes and assisted living facilities. Most companies require employees and residents to be vaccinated in order to prevent spreading the flu. If your loved one is not receiving personalized services from a home care agency and must be in a group setting, remind them to steer clear of others who are sick, cover their mouths when coughing and wear a mask when necessary. Keep viruses at bay by cleaning and disinfecting the home – especially in high-traffic areas like the kitchen and bathroom. Remember to include to light switches, door knobs and counter tops when cleaning. Swap out towels and sponges regularly.